This item is an IBM XT personal computer. The computer itself is 36x13x50cm and contains two 5.25" floppy drives (360KB), 640KB RAM, 20 MB hard disk drive, 8088 processor, 8087 co-processor, 1 parallel & 1 serial port. It is missing its graphics card. It is attached to a monitor which is 27x40x38cm (12" screen) and comes with a keyboard. The XT stands for eXtended Technology. From the serial number of the monitor, it appears to date from April 1985. The XT was released on March 8, 1983, so this model is a later one. At release, these systems cost $7545. In todays market, accounting for inflation, that amount is equivalent to over $16,000. This particular machine was produced in Wangaratta, Victoria. It was used by the University of Queensland Physics Department Computer Systems Manager until 1992. The XT is a descendent of the IBM PC released in August, 1981 and was released two years after the PC. The IBM PC was created by a team directed by Don Estridge in Florida. 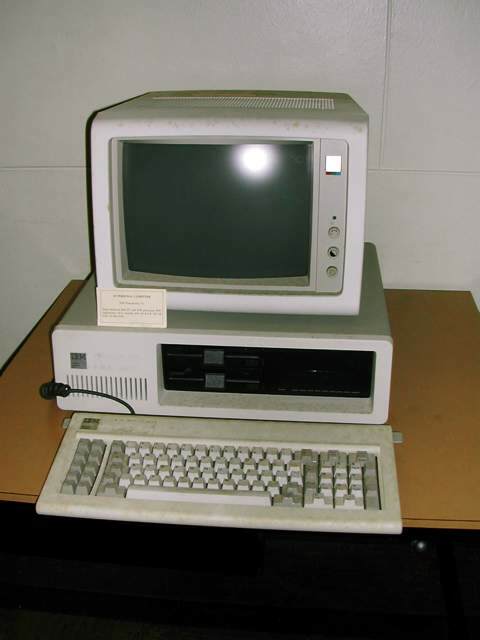 Prior to its release the term ‘personal computer’ was used as a generic term but the success of the IBM PC meant that the term came to mean a desktop microcomputer which was compatible with IBM's PC products. 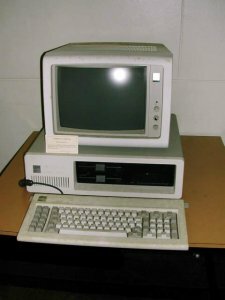 IBM's substantial influence on the market created a standard platform for personal computers and IBM compatibility was an important factor in a product's success. The only company to keep a significant market share without IBM compatibility was Apple Macintosh. IBM was founded in 1911 with the merging of three previously established companies. These companies were The Tabulating Machine Company, The International Time Recording Company and The Computing Scale Company of America and together they became the Computing Tabulating Recording Company. In 1924 the company changed its name to International Business Machines Corporation and today is a multinational technology and consulting corporation.